PHOTOS: Here's How Muslims Worldwide Are Celebrating Eid al-Fitr, The End Of Ramadan : The Two-Way For many Muslims around the world, Sunday marks the start of Eid al-Fitr, a time of prayer and celebration. Here's a peek at the festivities, which are often as different as the places they're held. 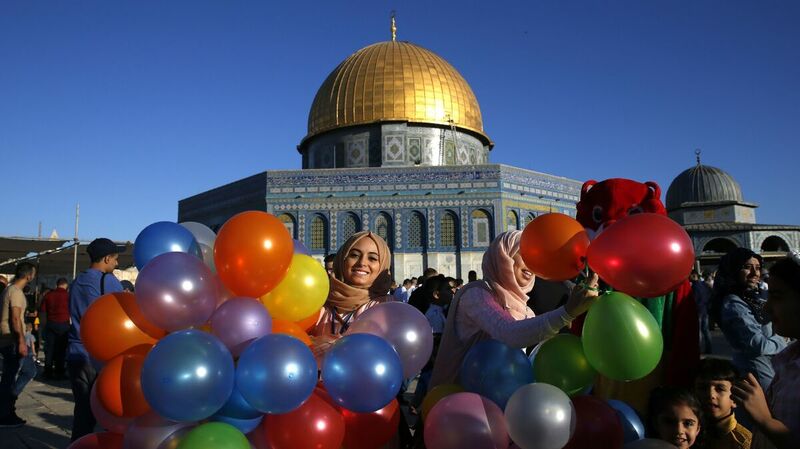 Balloons, body paint, joy and mourning — across the world Sunday, Muslims gathered to celebrate the end of the holy month of Ramadan, and the festivities took nearly as many shapes as the places they were held. Now, not every Muslim opened the Eid al-Fitr holiday Sunday. Because it relies on a lunar calendar, the festival marking the start of the new month depends on a sighting of the moon, which can vary from place to place. In Pakistan, for instance, worshipers are to wait until Monday for their celebrations. But much of the world had no such wait. In countries on just about every continent, Muslims gathered for prayer, reflection and a joyous conclusion to the fasting month of Ramadan. Just in case you can't make it to these dozens of countries yourself Sunday, here's a glimpse of the festivities. 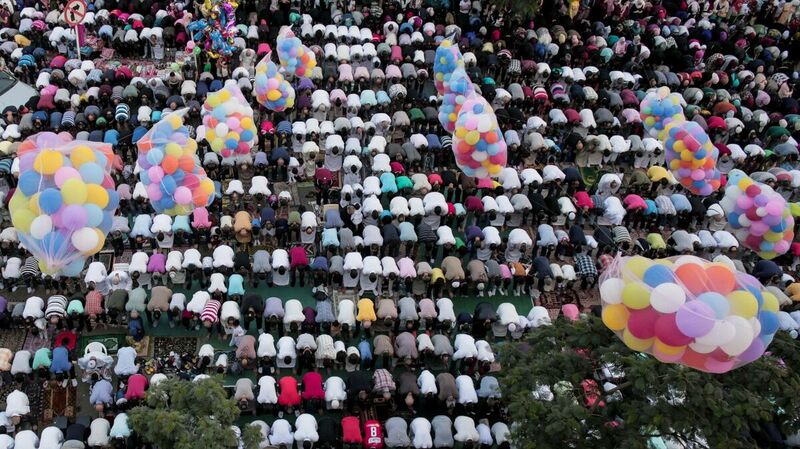 Egyptians gather on a city street in Cairo to pray beneath bunches of balloons. 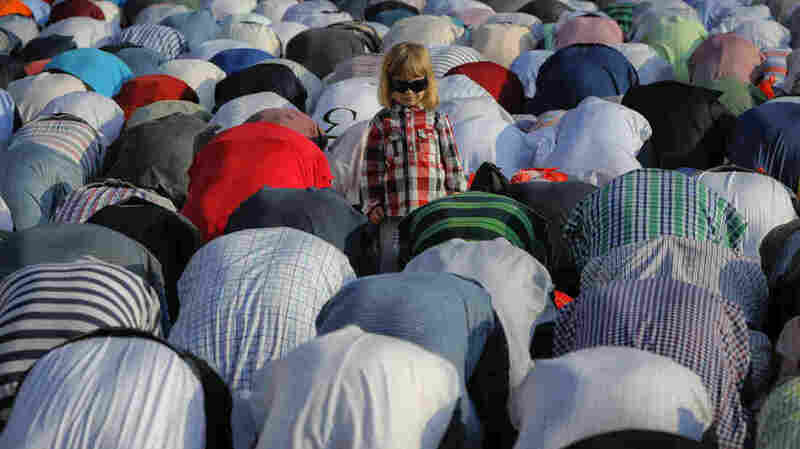 A child stands among the people taking part in Eid al-Fitr prayers in Bucharest, Romania. Members of the country's Muslim community gathered at the massive Dinamo soccer stadium in the Romanian capital. 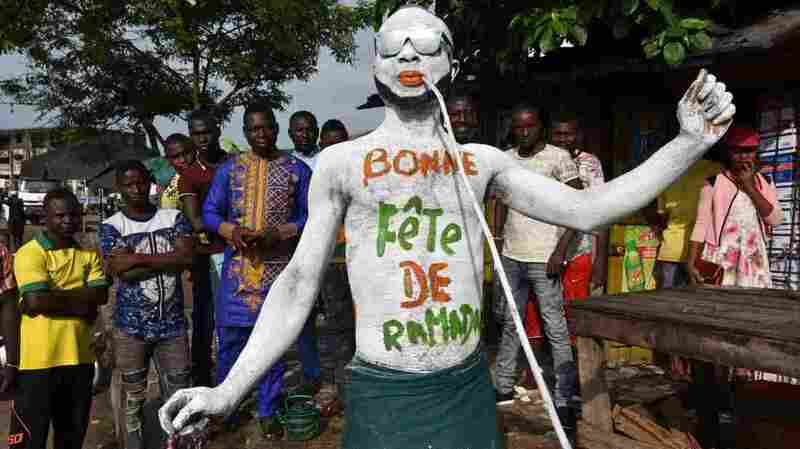 A man painted with the phrase "Happy Ramadan" in French dances through the streets of Abidjan, Ivory Coast. 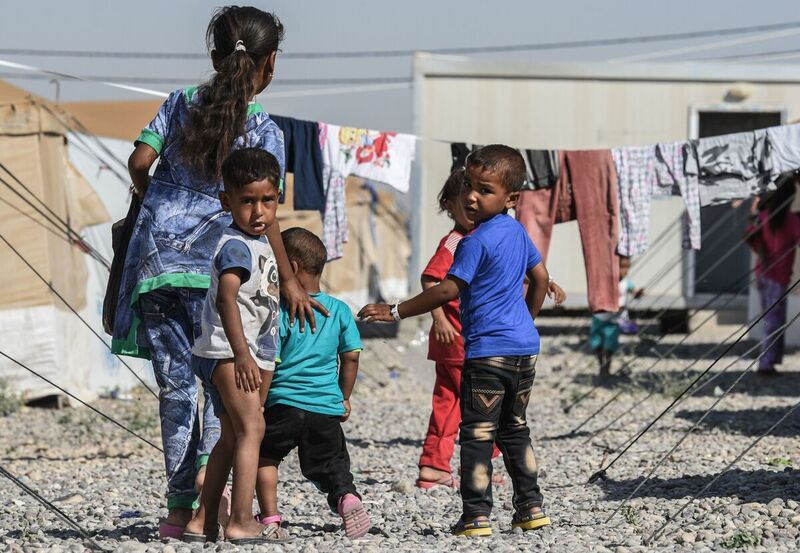 An Iraqi family who fled the fighting in Mosul walk through a camp for displaced people, south of the embattled city. For many Iraqis, especially those from war-torn Mosul, Eid al-Fitr would have to be celebrated far from home. 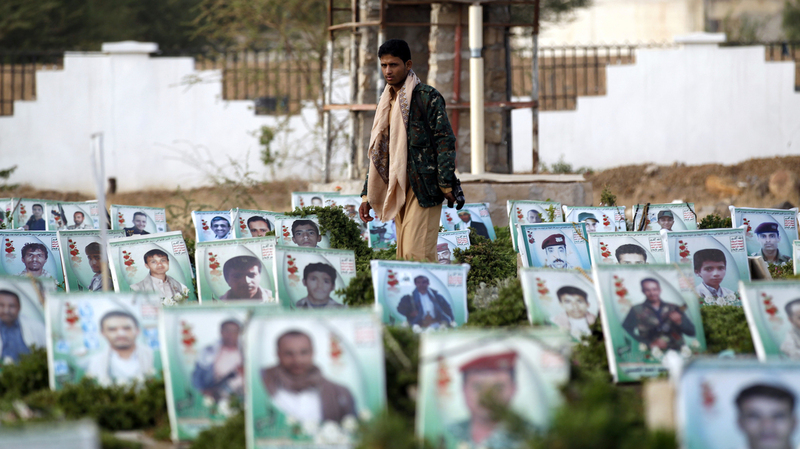 A Yemeni man bearing a gun walks through a cemetery after prayers in the country's capital, Sanaa. For more than two years, Yemen has been ravaged by civil war, and now the country is also facing the "worst cholera outbreak in the world," world health authorities say. Young men wash up before performing their Eid al-Fitr prayer at a mosque near Mount Sinabung, an active volcano in Indonesia. A Palestinian woman holds onto some balloons before the morning Eid al-Fitr prayer near the Dome of Rock in Jerusalem. 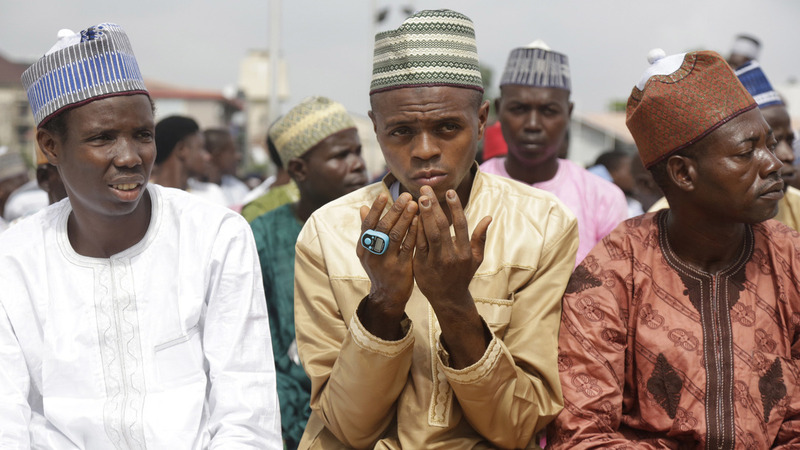 Young men offer Eid al-Fitr prayers outdoors in Lagos, Nigeria's largest city. 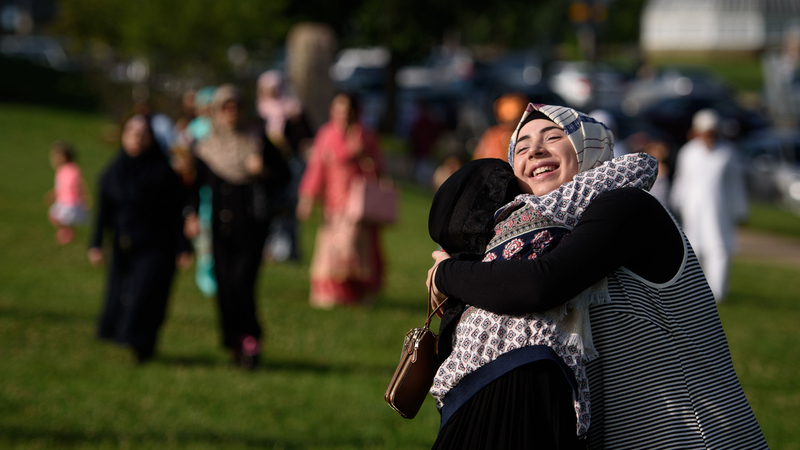 Aya Attal, 17, hugs a friend at an Eid al-Fitr celebration in a park in Pittsburgh, Pa.